Up to the highest height. These photos are all from the International Kite Festival in Weifang, Shandong Province, China in different years. Sadly we will miss it this year. Weifang claims (as do a few other locations) to be the “Kite Capital of the World” and every April they have the International Kite Festival. Making kites with bamboo frames and hand painted designs is a traditional art in the area around Weifang. Once they are dry they are ready to cut out. Display of several traditional kite designs. Family getting ready to fly a traditional butterfly kite. Traditional butterfly kite soaring during the International Kite Festival. Many people fly kites for enjoyment and relaxation. There are a couple of public squares where people come to fly kites, on weekdays this seems to be mostly retired men. On the weekends with good conditions everyone comes out. On my first trip to Weifang I was fortunate to be invited to come along to watch. My post A chance encounter tells about this. In the countryside around Weifang City you occasionally will see a display of bright, billowing kites at the entrance to a narrow dirt road. These indicate that if you wander down that road you will come to a kite factory. Butterfly bodies…should I call them Larva? It is held at “The beach of Happy Sea of Binhai development zone in Weifang City, Shandong, P.R.C.” It is a long trip from the city center. I’ve been twice. Both times I took public buses, a great deal but not for the feint of heart. The first time it poured rain, I spent about 4 hour there and was wetter than I have probably ever been. It was still fascinating to see the wide variety of kites. The post I wrote about that experience is Kites and Umbrellas. The next day, naturally, was gorgeous, we spent it at a special kite field day at the school where my son taught, the post about that is Kites and Kids. The grey sky gives a good backdrop for the wide variety of fun shapes and bright colors. The people give you an idea of how large these kites are. The dragon had landed before I got there to see it. Last year, the weather was beautiful, and so were the many beautiful kites. Because I took a bus after breakfast and missed the big opening. But there were many families out flying kites on the beach in addition to the extra large and fancy ones. It was a pleasant day, in town it was in the 80’s but at the beach of Happy Sea it was cooler. I’m hoping to get there again this year. Maybe I’ll finally get to see the big dragon in flight. Kites, airplanes, birds…all things that fly. Cee’s Back and White Challenge: Anything that flies. Just over two years ago I had a chance encounter that led to one of the best experiences I have ever had. I was walking around in Weifang, China, where my son lives. I was not only lost but clueless about how very large the city was. Weifang’s claim to fame is kites. 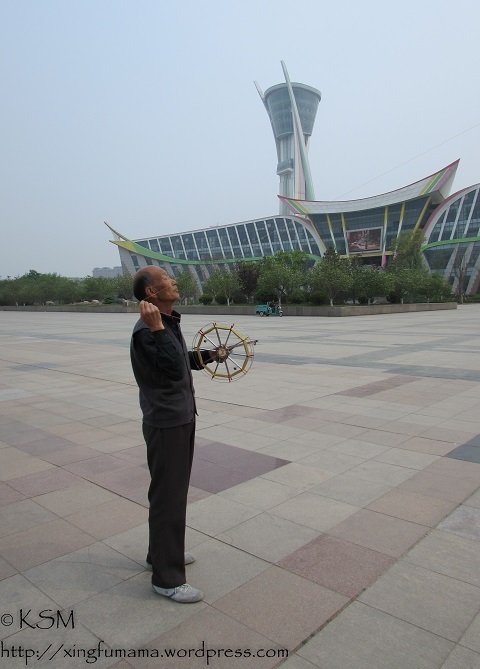 They have a kite museum and I, incorrectly assumed it was in the very large complex that is called people’s square (it is in People’s Park, a few miles away). I was wandering about, my second day in town, still a bit jet lagged. I didn’t have a map or instructions so I just wandered. My feet were getting tired and I was starting to wonder if I should head the kilometer or two to the mall where I knew I could get a cold drink, when a man carrying what looked like it might be a fishing rod in a case stopped next to me as I watched some fish in an artificial waterway. He pointed to some things I smiled. I thought maybe he was going to fish. But somehow, without either of us speaking a word of the other’s language he indicated I should follow along and I did. He was carrying a kite. I had not tried to fly a kite since a child and I never had much success the once or twice I tried. This guy could fly a kite, and so could the other men in the park. It was amazing to see how high the kites went, and impossible to really show with a photograph, although I tried. Soaring up in the atmosphere. With your feet on the ground you’re a butterfly in flight. It was great fun to watch. I couldn’t believe it when he gave me the controls! He wanted to try out my camera so I handed it over (one of the great things about having a not horribly valuable, hard to use camera is the ability to do that). He had fun playing with my camera and I experienced being “a bird in flight, with my fist holding tight to the string of a kite”. It is a great sensation feeling and adjusting to the wind. It was one of those times when you are fully there in the moment. I knew I was having one of the times of my life and kept at it until my neck started to cramp up. He took a lot of pictures, many of them of me (I am a bit of an oddity in that city as I have mentioned in a couple of other posts). I think I look pretty happy in the picture (that doesn’t often happen, I am one of the people who is always blinking, scratching my nose or something just as the camera fires). I have written about this experience before. I just can’t believe that it happened to un-impulsive, stay-away-from-strangers, plan-it-all-out-ahead-of-time me. That experience changed me, it made me much more comfortable going with the flow and being open with strangers. One of the pictures he took of me with his kite is my gravatar. A butterfly is a good symbol for a life changing experience. It seemed like someone flipped a switch Saturday night, turning off the shower, and the sky cleared. Sunday was beautiful, sunny and in the 60s with some wind. It was the perfect day for the kite flying field day at the kindergarten where my son works. Families came with their kites.They did some dancing and some kite flying, everyone had a great time. Me included, even though all I did was watch. Weifang, where my son lives has one major claim to fame: the International Kite Festival. They love their kites. You can buy your own set of wings. Kite shop in Weifang, China. 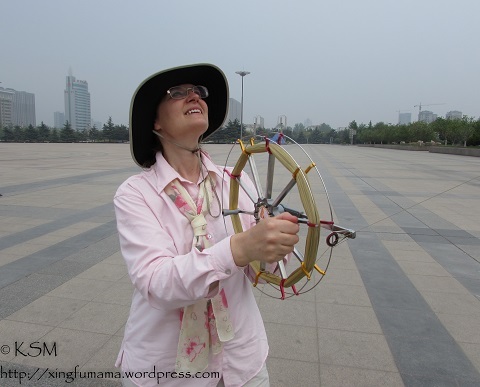 I had a serendipitous backwater experience in Weifang last spring…I got to fly a kite with an older Chinese man who did so as a hobby. Even though we could not “understand” each other we somehow understood each other. With your feet on the ground you’re a butterfly in flight, with your fist holding tight to the string of your kite. I learned his name because a young woman who spoke a little English and worked in a nearby coffee shop was out walking in the park during her lunch hour and stopped to chat.